Chic glamour from American fashion label Michael Kors. An elegant rose tone dial with beautifully complements its sparkling stone set bezel. A stylish stone set rose gold tone bracelet offers a contemporary edge. 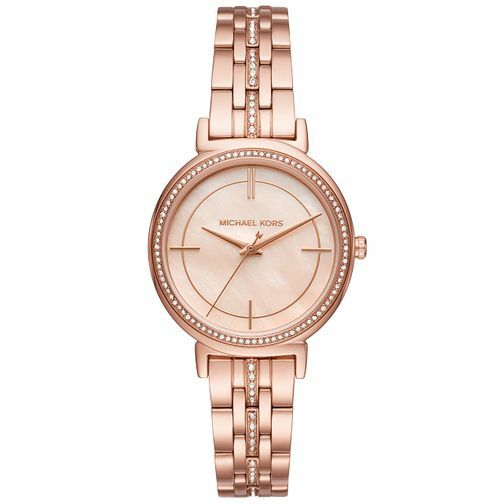 Michael Kors Ladies' Rose Gold Tone Bracelet Watch is rated 5.0 out of 5 by 2. Rated 5 out of 5 by Anonymous from Amazing Watch!!! Excellent Delivery Serive. I Love the rosegold tone of the Watch. Very elegant. Suits perfect on small wrists(my wrist is very thin)and thin dial makes it sit perfectly. Unlike other MK watches , which are too big and heavy this watch is slim , elegant and very sober. Can be worn for formal and informal occasions!!! The bracelet was too big , but had it sized at local store. And it’s Perfect. Good customer service. Got regular updates on the order until it’s delivered. Would use the service again. Thank you. Rated 5 out of 5 by Anonymous from Absolutely Fabulous Absolutely loving my watch. Looks great and very classy. I don't like very big faces so this is perfect.